MARTINSVILLE, Va.– One clock wasn’t enough for Kyle Busch this weekend because he dominated and scored a second grandfather clock at the Virginia paperclip. The driver of the No. 18 Joe Gibbs Racing Toyota led 352 of the 500 laps on his way to scoring the victory in the STP 500 at Martinsville Speedway. It’s his 35th career victory in the Sprint Cup Series and first at Martinsville. AJ Allmendinger brought his No. 47 JTG Daugherty Racing Chevrolet home to a runner-up finish. Kyle Larson rounded out the podium in his No. 42 Chip Ganassi Racing Chevrolet. Austin Dillon finished fourth in his No. 3 Richard Childress Racing Chevrolet and Brad Keselowski rounded out the top-five in his No. 2 Team Penske Ford. Carl Edwards finished sixth in his No. 19 JGR Toyota. Brian Vickers finished seventh in his No. 14 Stewart-Haas Racing Chevrolet followed by Paul Menard who led 10 laps on his way to an eighth-place finish in his No. 27 RCR Chevrolet. Jimmie Johnson finished ninth in his No. 48 Hendrick Motorsports Chevrolet while Ryan Newman rounded out the top-10 in his No. 31 RCR Chevrolet. Pole-sitter Joey Logano led 21 laps, but fell way off early in the race, was busted for an uncontrolled tire and recovered for an 11th-place finish. “It was frustrating,” said Logano. “You want to go out there and win for sure and we just missed it. The first run was just absolutely awful to go down a lap from the lead, so we fought to get our car better, which we did, and then we over adjusted and came back and over adjusted on the way back, and then we had a pit road penalty. I think we know where we missed it, but we didn’t have the tools to fix what we needed to fix. Once the race starts a lot of times your hands are tied because you only have a certain amount of adjustments on your car or even on pit stops that we could fix what our problem was. Matt Kenseth led 45 laps and restarted the race second on the final restart, but was unable to get to the bottom and finished 15th. Despite leading 72 laps, Kevin Harvick was a non-factor toward the end as he finished 17th. The race lasted three hours, 17 minutes and two seconds at an average speed of 80.088 mph. There were 11 lead changes among five different drivers and eight cautions for 51 laps. Nineteen cars finished on the lead lap and three failed to finish. Harvick retains the points lead after Martinsville followed by Johnson (-4), Kyle Busch (-5), Edwards (-14) and Logano (-24), to round out the top five. 1. (7) Kyle Busch, Toyota, 500. 2. (6) AJ Allmendinger, Chevrolet, 500. 3. (17) Kyle Larson, Chevrolet, 500. 4. (29) Austin Dillon, Chevrolet, 500. 5. (11) Brad Keselowski, Ford, 500. 6. (25) Carl Edwards, Toyota, 500. 7. (3) Brian Vickers, Chevrolet, 500. 8. (4) Paul Menard, Chevrolet, 500. 9. (24) Jimmie Johnson, Chevrolet, 500. 10. (5) Ryan Newman, Chevrolet, 500. 11. 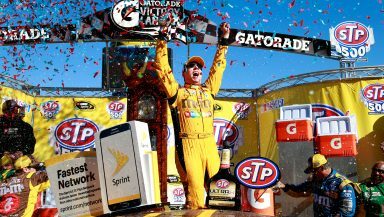 (1) Joey Logano, Ford, 500. 12. (14) Greg Biffle, Ford, 500. 13. (23) Kurt Busch, Chevrolet, 500. 14. (21) Dale Earnhardt Jr, Chevrolet, 500. 15. (9) Matt Kenseth, Toyota, 500. 16. (28) Danica Patrick, Chevrolet, 500. 17. (19) Kevin Harvick, Chevrolet, 500. 18. (16) Martin Truex Jr, Toyota, 500. 19. (12) * Ryan Blaney #, Ford, 500. 20. (10) Chase Elliott #, Chevrolet, 499. 21. (22) David Ragan, Toyota, 499. 22. (2) Kasey Kahne, Chevrolet, 499. 23. (15) Jamie McMurray, Chevrolet, 499. 24. (27) Michael McDowell, Chevrolet, 498. 25. (30) Clint Bowyer, Chevrolet, 497. 26. (26) Brian Scott #, Ford, 496. 27. (32) Trevor Bayne, Ford, 496. 28. (33) Landon Cassill, Ford, 495. 29. (35) Matt DiBenedetto, Toyota, 495. 30. (31) * Cole Whitt, Chevrolet, 495. 31. (18) Casey Mears, Chevrolet, 494. 32. (13) Ricky Stenhouse Jr, Ford, 494. 33. (36) Chris Buescher #, Ford, 491. 34. (34) Regan Smith, Chevrolet, 491. 35. (38) Michael Annett, Chevrolet, 490. 36. (37) Joey Gase(i), Ford, 490. 37. (40) * Reed Sorenson, Chevrolet, 490. 38. (39) * Josh Wise, Chevrolet, Engine, 326. 39. (8) Denny Hamlin, Toyota, Accident, 221. 40. (20) Aric Almirola, Ford, Engine, 206.